Abstract: Objective To preliminarily explore potential genes related to radiation resistance in colorectal cancer at the molecular level, we employed bioinformatics to screen different expression genes for radiation resistance in colorectal cancer cells. Methods The comparison between the gene expression levels of radiation resistance colorectal cancer cell lines and parental cell lines was downloaded from the Gene Expression Omnibus(GEO) database. 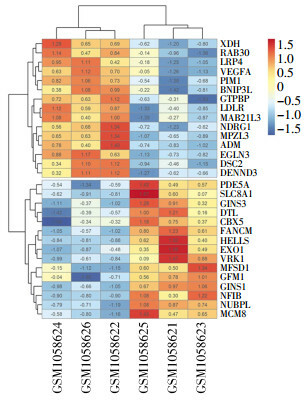 The differentially expressed genes(DEGs) were screened by using the R Programming Language and were analyzed through Gene Ontology(GO) functional enrichment analysis and kyoto encyclopedia of genes and genomes(KEGG) pathway analysis and by using protein-protein interaction(PPI) networks. 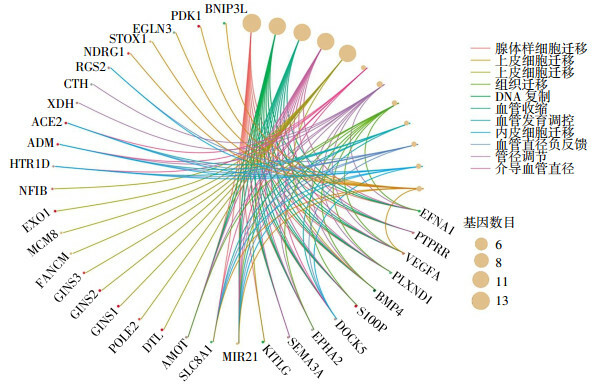 The hub genes were obtained on the basis of a PPI network. The mRNA relative expression level of the hub genes was verified via quantitative real-time polymerase chain reaction in HCT116 after radiation. The statistical significance of the results was analyzed via student t-test. Results A total of 101 DEGs were found in GSE43206, including 67 upregulated genes and 34 downregulated genes. The GO enrichment analysis suggested that these DEGs are enriched in biological processes, including cell migration and DNA replication. KEGG pathway analysis indicated that these DEGs were mainly enriched in the hypoxia inducible factor-1 signaling pathway. 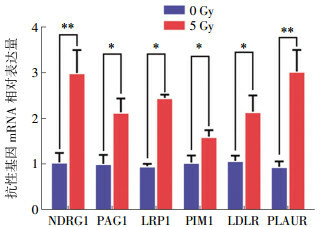 Six radiation resistance genes with high connectivity were identified on the basis of the PPI networks, including NDRG1, PAG1, LRP1, PIM1, LDLR, and PLAUR. Quantitative real-time polymerase chain reation verified that the expression levels of hub genes were markedly up-regulated in HCT116 after radiation, including NDRG1、PAG1、LRP1、PIM1、LDLR and PLAUR (t=49.981, P < 0.01; t=26.420, 28.698, 21.358, 23.545, all P < 0.05; t=50.601, P < 0.01). Conclusions The use of bioinformatics enabled effectively screening radiation resistance genes in colorectal cancer, which can be used for further researches. The molecular biology experiments confirmed the differential expression of potential genes after irradiation in colorectal cancer cell HCT116. 杨丽君, 万晓晨. 结直肠癌中miR-106b增强肿瘤细胞放疗抵抗作用机制的初步分析[J]. 中国现代医生, 2018, 56(1): 29–31,35. Yang LY, Wan XC. Preliminary analysis on the mechanism of miR-106b enhancing the radioresistance of tumor cells in colorectal cancer[J]. Chin Mod Doctor, 2018, 56(1): 29–31,35. Ritchie ME, Phipson B, Wu D, et al. Limma powers differential expression analyses for RNA-sequencing and microarray studies[J/OL]. Nucleic Acids Res, 2015, 43(7): e47[2018-05-02]. https: //www. ncbi. nlm. nih. gov/pubmed/25605792. DOI: 10.1093/nar/gkv007. Goh KI, Oh E, Kahng B, et al. Betweenness centrality correlation in social networks[J/OL]. Phys Rev E Stat Nonlin Soft Matter Phys, 2003, 67(1 Pt 2): 017101[2018-05-02]. https: //www. ncbi. nlm. nih. gov/pubmed/12636633. DOI: 10.1103/PhysRevE.67.017101. Foekens JA, Peters HA, Look MP, et al. The urokinase system of plasminogen activation and prognosis in 2780 breast cancer patients[J]. Cancer Res, 2000, 60(3): 636–643.